Wooden frame, veneered plywood ends, vinyl-covered aluminium shell – top and bottom, hinged. 2 (each with 32′, 16′, 8′, 4′, 2′ stops , which can be combined). The oscillators have independent switchable output of c.25% pulse, square, and rising sawtooth waveforms; these can also be combined in each oscillator. Individual VCO level cannot be adjusted, though VCO2 can be switched off, and VCO1 can be replaced with Noise. There is also a Glide control (portamento/glissando) – variable and switch (for both oscillators). There is also a “Pitch” mod wheel. 1 White (switchable as an alternative to VCO 1). Noise level cannot be adjusted. 1 Low-Pass, with a manual mode with Cutoff, Resonance and Contour (= envelope level), plus 5 presets (combinable). There is also a separate “Brilliance” control which appears to raise or lower the cutoff point by around a third of the full range. 1, with a manual mode with direct access to the envelope, plus 5 envelope presets (combinable). 1, assignable to either Oscillators (“Vibrato” mod wheel) or Filter (“VCF Mod” knob), with on/off but non-variable delay (“Delay Vibr.”) on routing to oscillators only. Combining means getting 2+ radio buttons to stay down simultaneously. Difficult, not reliable for performance, and it gets progressively harder with each extra button. Experimenting with this, I can get up to four registers at once; Iʼm not sure whether the mechanism will permit the fifth. It is possible to get all four waveform buttons down at once, so probably. I havenʼt been able to get more than four presets down either. This does permit interesting combinations like VCO2 Pulse+Square+Saw+Off, and either VCF or VCA 3-presets+manual. Iʼll try this out in more detail in future once some other issues are dealt with. There is a mains fuse , mounted on the underside of the case, and two for low-voltage AC on the power regulator board. This is s/n 270379. 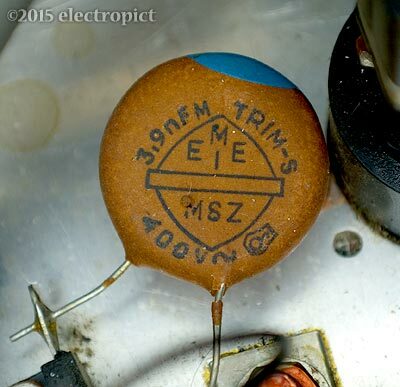 It has an internal stamp 870042 which may indicate assembly in 1987 – consistent with its having the later type of VCO circuit. Aside from a rearrangement of control knob colours, some replacement bolts and some dodgy cosmetic repairs, itʼs unmodified. 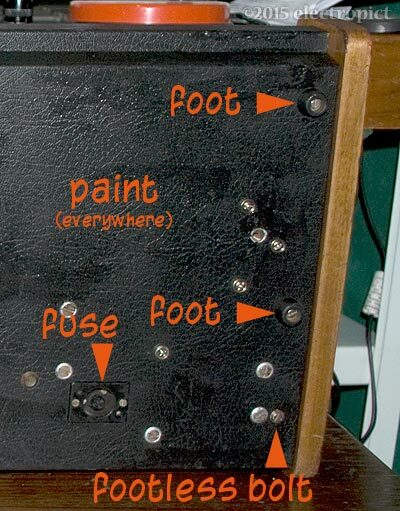 There are four rubber feet, but weirdly, one of them – on this Vermona at least – is not placed symmetrically with the others; itʼs in the middle of the right side rather than at the back right corner. Itʼs not clear whether this is original. A foot would just fit in beside the transformer bolts, indeed, thereʼs a bolt in place which could hold one – and an unused bolt in the middle of the left hand end. Maybe thereʼs two missing? This isnʼt stable, and adds to the impression of structural weakness. Some writers suggest the keyboard is difficult to play. This one feels more or less normal to me. (Normal = not touch sensitive, no aftertouch, no force feedback.) Maybe the keys land a little hard. They are heavily scratched though – looks like someoneʼs been playing them while wearing steel fingerpicks or knuckledusters or something. Iʼve only seen marks like these before down low on wooden doors, left by years of lonesome dogs. Other than that, theyʼre in good shape, though uneven. Clean on top, and thatʼs not always true of secondhand synths. 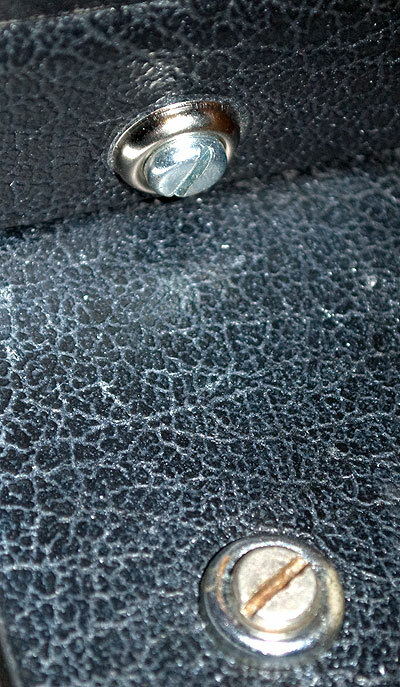 IN1: Replacement or refurbishment of knobs. Non-critical. First get into it. This is unusually straightforward. The control panel is attached to the keyboard panels by a bolt on either side. With these out, the top hinges back to allow circuit access. 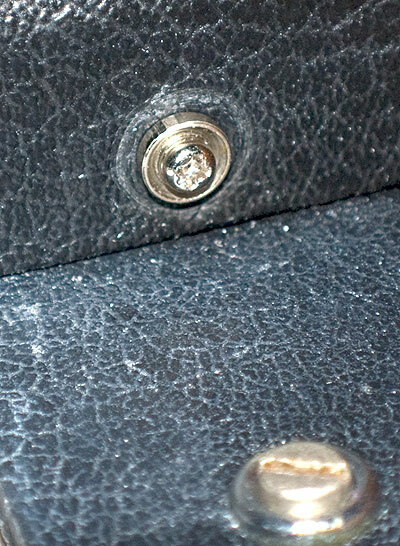 The hinge is one piano hinge screwed in along the whole back – rather than the two or three weaker hinges you see in many more expensively built synths. The keyboard is held down by two more bolts. 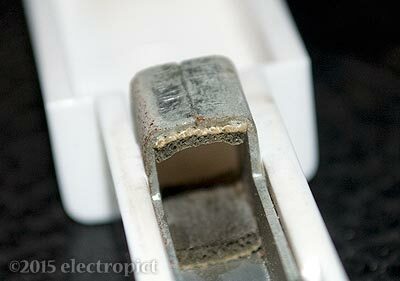 It also hinges up – but only to the point where the right upper panel fixing bracket hits the transformer. (Good that it hits something solid rather than PCBs.) With the bracket off you have full access to unscrew the hinges if required. 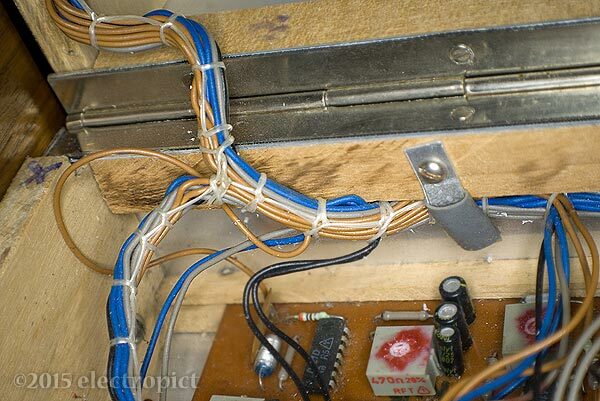 The keyboard cannot be completely removed without desoldering wires, though. The keybed is steel, rigid and strong enough to join the panels on either side all by itself. Itʼs rusting a bit, which isnʼt at all welcome. The contacts are j-wires, in pairs, on plated bus-bars. 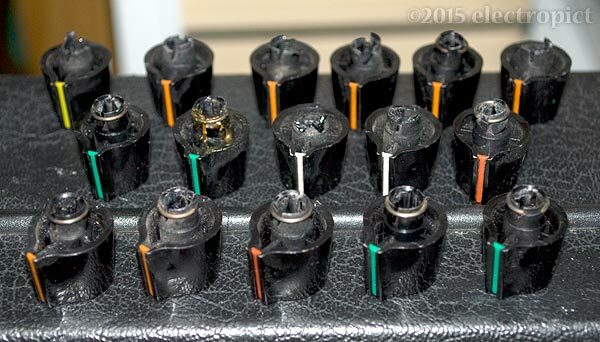 The wire-holders are separate from the key tops; they can be unclipped with care, allowing removal for cleaning. And, yes, all 88 wires are soldered in with resistors, by hand. Someone put a lot of work into that. The main challenge is getting the keys off to clean underneath. 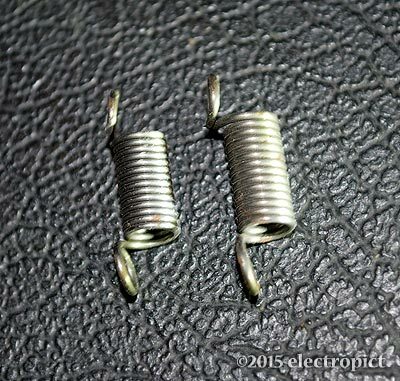 First, pull the key-return springs off (try to avoid them flying all over the room). 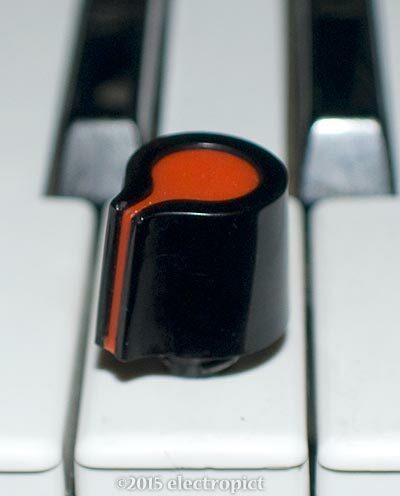 There are two different types, the black keys using slightly smaller ones – keep separate. 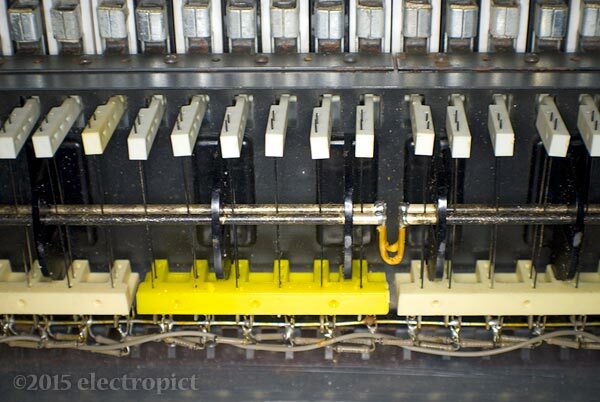 There are two types of wireholders – one (pictured above) for the C keys (not including the top C; three of these in this keyboard), and a mirror-image type for all the others. They do unclip, but Iʼm not content with this process. They clip onto a steel pin in the key, and take a little force to push off (using a small screwdriver/probe); it seems likely that as the plastic degrades the clips will eventually all crack in the attempt. One did this time, but still usable. 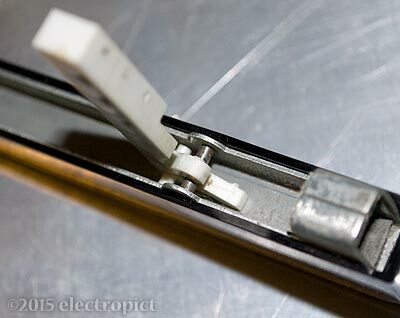 Once the keys are out, the holders can be manoeuvered off the contact wires. In retrospect I think Iʼll take them out as I go next time; theyʼre potentially hazardous to the wires while loose in place. These keys are in worse condition than Iʼd thought; the scratches and indentations are much clearer when theyʼre off. Some of this may be manufacturing flaws, but I doubt it; some of it really looks like solvent spillage ... also there are traces of black marker on some white keys and white paint on some black keys. But I suspect the scratching is where someone scraped glue off after the keys had begun to dissolve. The keybed is not in bad shape; also not the dirtiest; a little rusty here and there, but a wax polish should help. It would be nice to go further, but the contact wire racks are glued and plastic-welded in place – there really seems no way of removing them short of drilling them out and reattaching with bolts. This limits cleaning options. The wires could be removed, all 88 of them, either by desoldering, or perhaps as a single net along with their resistors, but Iʼd hate to have to do it, let alone reinsert; and it would achieve little. So, vacuuming and polishing on top, and just a fine-tip vacuuming for the underside, I think. The bus bars clean up electrically reasonably well; if they needed anything more than wiping with contact cleaner they could I think be desoldered and unclipped. The bushes on the retaining brackets are fairly hard plastic, rather than rubber. 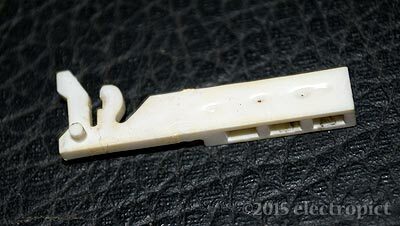 The keys themselves have spongy damping inserts – a bit aged here, but extremely difficult to replace cleanly. Not this time, anyway. The brackets are mild steel, and can be bent by finger pressure to adjust final key height. In reassembly, it seems that clipping the wireholders back into the keys is harder than getting them off, particularly on the black keys. A little plastic-safe lubricant helps, and should ease future removals. 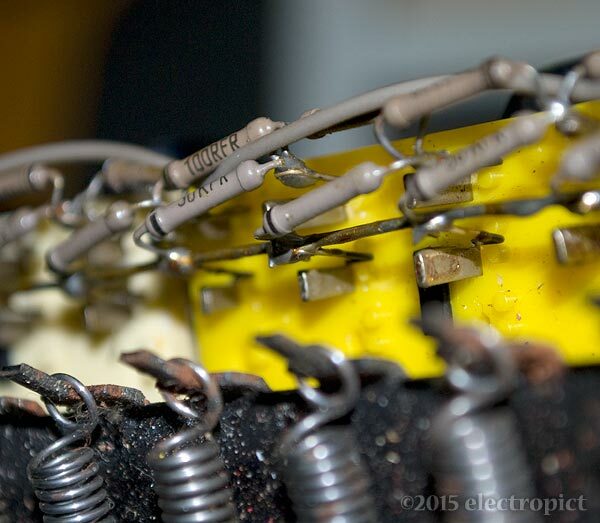 The wireholders have to be put back on the wires before mounting the keys. (The photo below is for testing and demonstration.) The wires go into the lower two holes. At the same time, at least the circuits are fairly simple. These are not the most densely populated boards Iʼve worked on... (A nice thing about the Vermona design: not only small, discrete boards, but most of them are easily accessed. You can get probes on them still in place – and get them out for the camera easily.) Unfortunately they donʼt have any screened component numbers or descriptions. One laced bundle – 18 wires – goes to the keyboard, which itʼs going to be handy to make removable, so I might just cut it and put a connector in somewhere. Another nice thing is that the pots are all exposed under the panel, making access for cleaning quite simple. 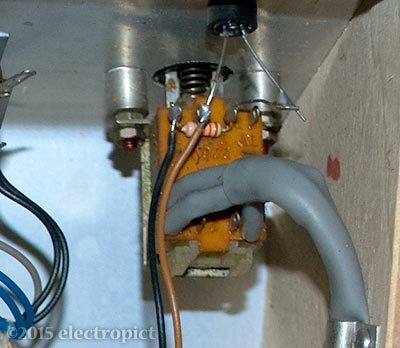 I notice in the picture below that the sustain pot is wired with two blacks – maybe the source of voltage on a black wire. In fact ... the ADSR pots are all wired with the same colour on both sides...? Hm. Good to know. The boards and mounts on the front panel are all bolted on – with 5·5mm hex nuts. Thatʼs awkward. And thereʼs not really room to get a normal ¼″ socket in to some of the nuts, so you need a spanner or a nut driver. This is the first time Iʼve had a use for my 5·5mm nut driver, and it turns out itʼs too long to get into the upper bolts. A small spanner might do for most of them; but even that isnʼt going to work on the power switch right nut. Maybe a c.60mm deep drive socket? Or it might take a box or crowfoot spanner? According to CHD, who do a MIDI retrofit for it, there were at least two versions of the Vermona, with component differences in the VCO board at least. 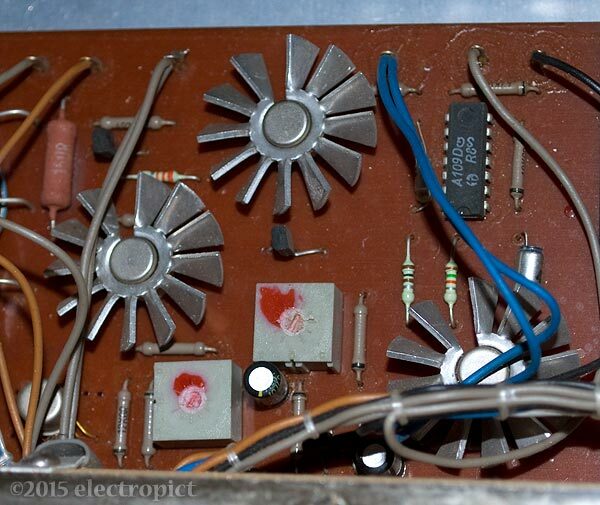 This is the later version, with A109D Op Amps. This Vermona also uses A109Ds on other boards, but I donʼt know whether that applies to the earlier version or not. 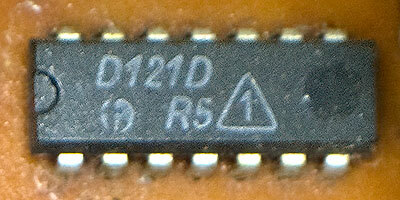 A109D Op Amp (lots of them), D100D Quad NAND Gate, D121D Flip Flop. These are DDR equivalents of common international components. Individual chips do have different Rn and Pn numbers; I donʼt know whether thatʼs significant. None of the ICs are socketed. Thereʼs an RFT-brand AC transient suppressor on the incoming supply. Itʼs linked from its ground terminal to the case, the regulator board, and the transformer through a large ceramic disc. Itʼs leaked. I donʼt know what itʼs leaked. I donʼt like it. Apart from some of the larger caps, most components arenʼt visibly that bad compared with other synths Iʼve had. 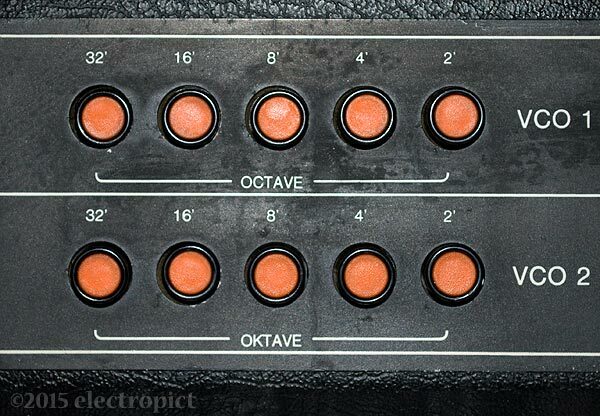 Of course, itʼs a decade younger than most synths built out of discrete components. IN2: Structural weakness. 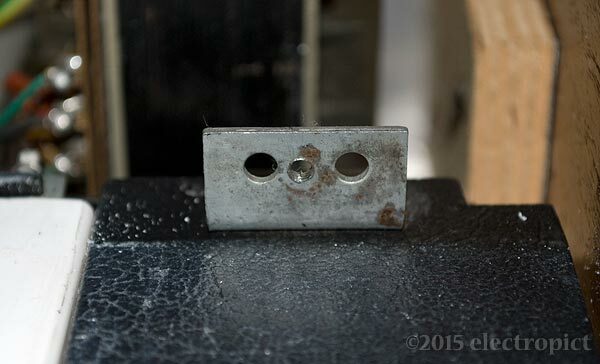 Consider strengthening rear corners with angle brackets. Non-critical. 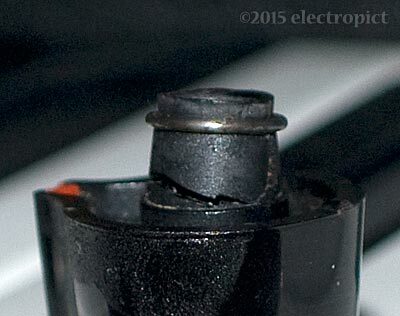 IN4: Find replacement for leaky transient suppressor. Switch on, and, right, a challenge! Power supply seems reasonable – though Iʼve not found a 21V circuit in a synth before (pending a full circuit analysis this seems to be solely for the power indicator LED; it stands a chance of being a nominal 24V supply). But otherwise, Iʼve never had a synth in such poor functional state. To the point where itʼs not really clear what some of the controls are intended to do. Likely to need recapping, new pots, and first, contact cleaning. Also, retuning. IN5: The Pitch control wheel seems to have no effect at all. IN6: The vibrato control ... well, it might work better if the LFO was working, but mostly it just lowers the pitch. Then it affects the LFO when high (see below). IN8: Very difficult to tune. The trim pots have been rather abused, and some of them seem to jump about a bit, but though replacement might be a good thing, I suspect there are other component issues affecting this. Consider replacement once other functions are corrected. As a non-specific issue, it also tends to produce random pitch and filtering shifts (even after being on and warm for hours); this may be sortable with pot cleaning, but may indicate a more significant problem. Aside from which, itʼs notable that the output on this Vermona is surprisingly loud. Not sure if thatʼs normal. But Iʼve been using it at about mark 4 (out of 10), which comes in about the same as mark 7 or 8 on most of my other synths. In spite of restricted work space it was possible to properly clean the pots. The key contacts are also accessible, if awkward. 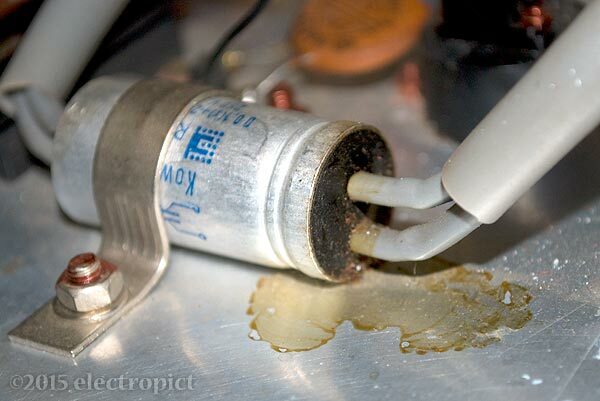 The LFO Speed pot emitted a chunk of something during cleaning. Not quite sure what. And afterwards it ceased to function completely. Which implies that the pot is the problem, and thatʼs an easier fix than a board repair, so, good. Probably. So IN9 is: generally poor condition of control pots. Consider across the board replacement. LFO Speed, VCF Contour and Resonance required. the filter resonance does not reach self-oscillation. Iʼm not yet clear what the Brilliance control really does, though it does seem to be a Low-Pass control, altering the VCF cutoff point. Maybe the intent is to have a filter control for the left hand too. (Admittedly, it seems handy like that.) More likely, itʼs there to allow cutoff point adjustment when using either manual or preset VCF settings. Iʼm not clear either how the Delay-Vibrato switch works, but tentatively it seems likely to be a simple slew limit which brings the effect in slowly (in slur mode, it doesnʼt affect secondary keypresses), rather than a complete delay. It doesnʼt seem to affect VCF Modulation. As with the Vibrato, it cannot be assigned to only one oscillator. I am just beginning to suspect that when people describe the Vermona as having an ‘evil’ tone etc., what they are really saying is, ‘itʼs randomly making noises I didnʼt expect’ – which this one certainly is – and actually the circuits are shot. (And/or the gain is so high theyʼre overdriving their amps.) The basic character of the sound here is surprisingly warm. But weʼll see what happens when thereʼs a functional filter and LFO. Itʼs going to be a bit of a project, isnʼt it? The first priority looks like obtaining or just drawing full circuit diagrams; thatʼs going to be necessary for working out many of the later details. Replacement components are clearly necessary. Some simple replacements should just proceed. Jack socket for headphones? I hardly think itʼs worth it. Iʼd like to test the headphone volume pot as audio, but that can be done with leads. MIDI (because the card is available...) and CV connections. Has anyone ever made a tank for a stage show? Consider that. I have considered it and come up blank. This is a synthesiser. Yer not gettinʼ in, donʼt even ask. ...which sort of raises the question, if manufacturers are, as seems to be suggested, close to producing artificial-intelligent and convincingly humanoid robots capable of learning complex behaviours like dancing, how much more difficult (and perhaps grotesque) would it be to have a humanoid, walking, talking, singing synth, played by touch? I mean, synth controllers built into your clothes are decades old now. The tech is probably in existence as I write, in primitive form, if it could be marketed. An attractive thing about this option is that the synths could actually dance around on-stage with the musicians (keytars never did it for me) ... or on the tank, of course.